You can freeze working orders in Autospreader without losing your spot in the queue. This allows you to react to a rapidly changing market, freezing and unfreezing orders when needed. 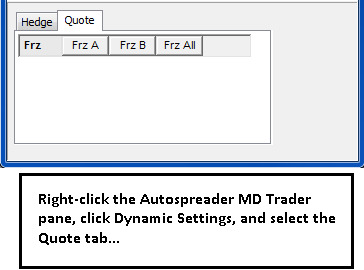 This option is accessible via the Autospreader MD Trader spread pane context menu. When enabled, you can freeze and unfreeze orders using the F hotkey on the keyboard. The hot key function freezes all legs when the Autospreader pane has focus. Frozen orders do not re-quote with price updates. The Do Not Hedge Frozen Orders option lets you configure whether or not you hedge frozen orders upon fills and partial fills. You can toggle this option using the Dynamic Settings tabs while you are trading. Orders immediately resume quoting when you unfreeze them. The color bar moves to the right side of the cell of a working order when you freeze it. From the MD Trader spread pane, right click to access the context menu and click Dynamic Settings. Click the Frz All button to freeze all working orders in all Autospreader panes, or click the Frz <leg> button to freeze orders for a particular leg of the spread. The frozen working orders are color-coded on the right-side of the cell to indicate they are frozen. To unfreeze, click the corresponding button. All working orders in the Autospreader pane and legs are color-coded on the left-side of the cell to indicate they are no longer frozen. Click Settings from the Control Panel and select Properties. Click the Autospreader tab and click the Use Hot key for Freeze/Unfreeze checkbox (then click OK to save and exit). Click the Autospreader MD Trader spread pane. To freeze your position in queue, press the F key on the keyboard. All working orders in the Autospreader pane and legs are color-coded on the right-side of the cell to indicate they are frozen. To unfreeze, press the F key again. 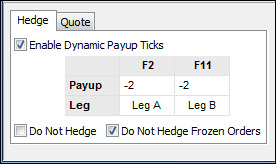 Right-click the MD Trader spread pane and click Dynamic Settings.